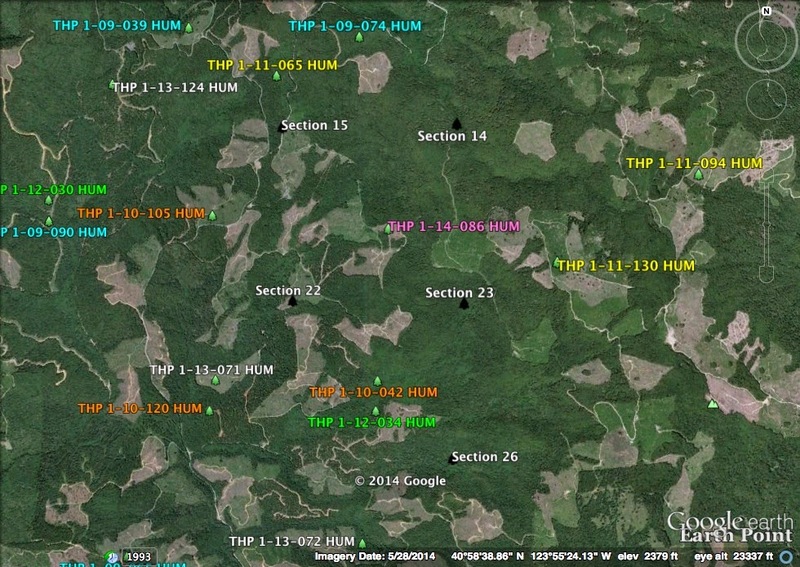 THPBlog: Green Diamond Resource Company to clearcut log north of Highway 299 near the Coast Range summit. Green Diamond Resource Company to clearcut log north of Highway 299 near the Coast Range summit. This THP is about 8 miles NE of Arcata, CA and a few miles north of Highway 299 near the coast range summit. Green Diamond Resource Company is planning a mostly clearcut feller buncher and cable logging operation in redwood and Douglas fir forests at an elevation of 1,560 to 2,620 feet. The THP area drains westward into the Mad River which is listed as impaired for sediment/siltation and temperature. There are multiple misc road failure sites mostly related to crossings including fill failures and road bed channeling, and deep seated landslide terrain in unit G. 35 road drainage sites are planned for work including rocking, dip construction, and culvert repair/replacement. A spotted owl nesting territory is located within .25 mi of unit G. More information is available on the THP Tracking Center website.